The Duolong area is the most important part of the Western Bangong-Nujiang Suture Zone porphyry Cu(Au) metallogenic belt, in Tibet, China. Here new detailed data are presented from LA-ICP-MS zircon U-Pb, whole-rock geochemical, and in-situ zircon Hf isotope analyses for igneous rocks in the large Naruo deposit (2.51燤t of Cu and 82爐 of Au) which is located ∼2爇m NE of the Duolong (Duobuza and Bolong) super-large gold-rich porphyry copper deposit. We integrated our results with previous research of other porphyry deposits in the Duolong area and have identified the timing, geodynamic setting, and petrogenesis of the mineralization-associated magmatic events. Based on the measurements, the Duolong area porphyry Cu(Au) deposit formations are associated with Early Cretaceous intermediate-felsic magmatism, which is consistent with U-Pb zircon ages of 120燤a. All the main intrusive rocks in the ore-concentrated area have similar lithogeochemical characteristics; they show a relative enrichment in both light rare earth elements (LREEs) and large-ion lithophile elements (LILEs: Rb, Ba, K, etc.) and relative depletion in both heavy rare earth elements (HREEs) and high field strength elements (HFSEs: Nb, Ta, Zr, Hf, etc.). Moreover, the granite porphyry shows positive εHf(t) values between 1.38�37 suggesting that magmas were potentially derived from the partial melting of a depleted mantle wedge that had been metasomatized by subducted slab-derived fluids or melts. 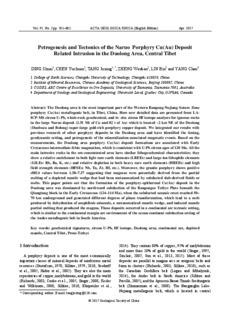 This paper points out that the formation of the porphyry-epithermal Cu(Au) deposit in the Duolong area was dominated by northward subduction of the Bangongco Tethys Plate beneath the Qiangtang block in the Early Cretaceous (124�4燤a), when the subducted oceanic crust reached 50� km underground and generated different degrees of phase transformation, which lead to a melt produced by dehydration of amphibole minerals, a metasomatized mantle wedge, and induced mantle partial melting that produced the magma. Those deposits occurred in a continental arc tectonic setting, which is similar to the continental margin arc environment of the ocean-continent subduction setting of the Andes metallogenic belt in South America.